Outdoor Courses for Scrambling, Climbing, Kayaking & Mountain Activities: Give a loved one, family member or friend a Gift Certificate for a Christmas Present with a difference this Christmas! Give a loved one, family member or friend a Gift Certificate for a Christmas Present with a difference this Christmas! Christmas 2015 is literally three weeks away! Are you still trying to decide what you want to buy that loved one, family friend or family member for Christmas? At Kendal Mountaineering Services, we can help! 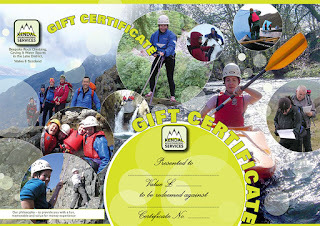 If any of your family are into the great outdoors, like trying adventurous activities; or have already been introduced to a particular sport such as Mountain Walking, Rock Climbing, Scrambling, Canoeing, Kayaking or Caving and would like to learn the skills to go off and do these sports for themselves - then you can help them experience these activities or learn those skills by buying them Kendal Mountaineering Services Gift Certificate for Christmas! Our Gift Certificates are designed to be flexible. You can check out the different activities and Skill Training Courses we offer by visiting our website and by visiting our Prices page. You do not have to make the full payment for any activity you see if you do not wish to - making a part payment towards someone's Activity Session or Skills Training Course is absolutely fine! Buying a gift certificate is easy! Having decided what you would like to buy, simply contact us to pay for; and arrange your Christmas Gift Certificate. Details we will require are who the gift certificate is for so that we can print their name on to it and also which Activity Session or Skills Training Course you are paying for/towards the cost of. The value of the purchase can also be entered on to the voucher if required. Payment for Christmas Gift Certificates can be done either by Cheque made out to Mr I Gallagher and posted to our business address (details on the Contact us page) or by Bank Transfer in which you'll need to contact us to be given the sort code & account number. Ideally, we also need an email address so that we can confirm receipt of your payment and then email you your Christmas Gift Certificate for you to print off and present. We do also offer a printing & posting service for those on you wishing to have the Christmas Gift certificate sent direct to the recipient. This costs an additional £1.50 per certificate and we will need a postal address if you require this service. So what are you waiting for? Contact us today to arrange that special gift with a difference for a loved one, friend; or family member this Christmas. They won't be disappointed!